The first book to study wood carving and its relation to shamanism among Kuna people from the San Blas Archipelago, providing a rich new lens for understanding the Kuna worldview. Paolo Fortis is a lecturer in Social Anthropology at Durham University. This book is an ethnography of wood carving and shamanism among Kuna people living on an island of the San Blas Archipelago, off the Atlantic coast of Panamá. 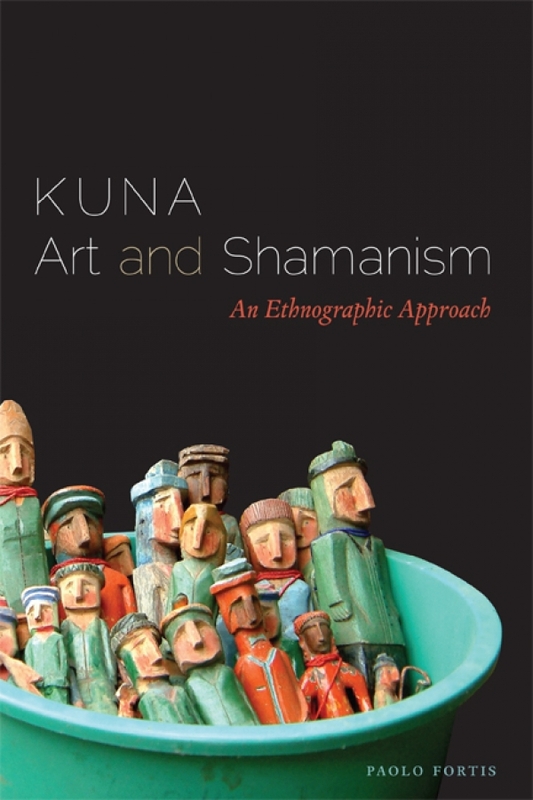 By describing the relationship between shamans and their auxiliary spirits, represented by carved wooden anthropomorphic figures, it explores the link between art and ontology. The main argument is that by inquiring into the visual system of a society, into the way people perceive the world and make sense of it in their daily life, we can gain better insight into their ideas about the social, the cosmological, and the person. This has two main implications: first, visual art is treated in this work more as a category of experience, a way of knowing, than as an aesthetic category. Second, visual art is examined through the category of the people who create it. By asking what it means to carve the figure of a person for Kuna people, different fields of experience of their lived world are explored. It is argued that Kuna categories of design and image are central to their conceptualization of the human person and to how they perceive the world. This work explores these categories through an ethnography of the everyday that focuses on Kuna discourses about what it means to be human. Birth and death are the limits of human life. By considering how the person is constituted and how illnesses and death are conceived, it is possible to understand how Kuna people see the world and experience the immanent relationships binding together the beings living in it. These relationships are conceptualized and acted on through designs and sculptural forms, among other media. It is my aim here to show that the category of the visual and the capacity to see are key to the process of becoming human among the Kuna. In order to properly understand what Kuna people mean by "visible" and "invisible" we need to unfold the experiential fields in which visual capacity has a prominent role. For this reason, in exploring the production and meaningfulness of Kuna ritual wooden statues, I place them at the center of the network of social relationships among people between themselves as well as with nonhuman entities. Carving wooden statues is an activity carried out by skilled elderly men. As I argue, it is through their embodied knowledge and lifelong experience of transformations that they mediate between mortal human beings and immortal primordial spirits, in order to cure and protect people from illness and death. Kuna wooden sculptures, nuchukana, are protectors and helpers of Kuna people. They aid shamans in curing and diagnostic rituals and protect households against the penetration of malevolent spirits. They are powerful coresidents of Kuna people. They nonetheless differ substantially from human beings, primarily in that they do not have bodies. Although they can be met in dreams and engage in conversations with shamans, and sometimes even with nonshamans, their material form, visible to everyone in waking life, is only a temporary abode for the immortal soul that inhabits each of them. This book argues that in order to talk about the visual experience that surrounds Kuna wooden figures and makes them meaningful for Kuna people, we have to explore their ontology; we have to look at the wider context in which the human person is considered to be constituted and within which people come to acquire their own knowledge of the world. In doing so, the ethnographic focus of this work is on the lived experience of people who engage in wood carving and shamanic initiation, which I chose as privileged roads leading to the understanding of the Kuna visual system. It is by focusing on the embodied lived experience of those who produce specific art objects that the meaning of those objects becomes known to the anthropologist. For Kuna people, as for most people who do not wish to develop an internal market for art objects, the meaning of art is intimately linked to the everyday experience of their lived world. Unlike the conception of Westerners, for the Kuna being invisible is not an intrinsic quality of any subject or object endowed with subjectivity; it is rather a quality of a relation between two subjects. That which sees and that which is seen engage in a relation in which predation and reciprocity often modulate the encounter. Similar to other Amerindians, Kuna people contend that seeing what lies beyond the limits of normal visual experience is the field of what anthropologists call shamanism. In the case of Kuna wooden statues, it is the visual capacity of 'seers,' nelekana, that enables them to see nuchukana in their real appearance as people, to converse with them and learn from them, whereas others are able to see only the carved wooden figure that hosts a primordial soul. Wooden statues act therefore as a boundary to human visual perception. In a similar way, bodies act as limits between the internal images of souls and external visual appearances. Human souls can be perceived detached from their bodies only in dreams, when they float free and meet with other souls. The relationship between the visual appearance of wooden statues and bodies and their internal images stands at the core of the analysis carried out in the present work. This gives rise to a series of questions concerning the Kuna visual system. First, if the "invisible" internal form of a nuchu (pl. nuchukana) is what counts in the relationship with ritual specialists, why do Kuna people bother carving anthropomorphic figures at all? This process seems redundant if seen from the outside, especially since Kuna people, along with most Amerindians, think that objects (not to mention animals and plants) possess souls, which, regardless of their external appearance—be it stone, tree, or animal—is that of a person. My argument is that the effort of carving a human form for hosting a primordial soul has to be seen as a generative act, which, despite the impossibility of creating a human body out of a part of a tree, bears a resemblance to human gestation and birth. Similar to the birth of a human being, carving a nuchu is about giving an individual form to a generic soul, allowing it to acquire a personality through establishing relationships with other human beings. The second question is, what is the relationship between designs and images? This question is a leitmotif throughout this book. Although it is indeed not fully answered, it opens a very interesting path of research that, as I shall suggest in the conclusion, points to a wider comparative field of research on Amerindian art. Let us now begin with a discussion of how this question arose during my fieldwork. Initially, I went into the field with the idea of studying the Kuna women's diverse cloth designs of their colorful blouses, molakana, sewn in a rather complicated reverse-appliqué technique. Molakana are known worldwide and sold internationally. I became interested in mola designs before commencing my fieldwork and dedicated my undergraduate thesis to the creation of analytical models for interpreting the cognitive processes followed by Kuna women when sewing their molakana. Then, once I started my Ph.D studies, I decided to go to the field to observe what Kuna women actually do and say about their creative process. Unsurprisingly, I found myself in the awkward situation of not really knowing how to formulate my questions to Kuna women, most of whom did not understand what I was interested in. In fact, I slowly became aware that I was less and less confident about the nature of my interest. Sitting on the patios of their homes observing women sewing their mola, I often wondered how I had gotten myself in that embarrassing situation. Insisting on asking about the meaning of designs, I was clinging to my common understanding and sociohistorically informed ideas of art. My questions appeared to be meaningless to Kuna women, though were keen to show me their beautiful molakana and soon suggested that I find an elder man knowledgeable in Kuna ancient history and able to teach me about the origin of mola, about which the women seemed quite uninterested. I've carved it. This is a nuchu. It's like a house. Now I'm going to explain to you. If, for example, gringo soldiers wanted to come here, first of all they'd need a house to stay in. They'd need a house to be built for them before coming here. Otherwise where would they stay? It's the same for the souls of trees. If I carve a nuchu they can come here from the fourth layer under the world. They come to help us, to protect us against illnesses. Walking home after my conversation with Héctor, I kept thinking about what he had told me and about his nuchu. Although I could not make sense of his words, I felt a genuine interest in what appeared to me a completely different vision of the world. What is a nuchu? I asked myself. Why did Héctor describe it as a house? Thinking about these questions during my stay in Okopsukkun led me deep into the exploration of Kuna cosmology and specialist knowledge, which provides the ethnographic material on which the present analysis is based. What I did not realize then were the theoretical implications of Héctor's switch of topic from mola designs to nuchu figures. I now find it fascinating how he turned the topic so swiftly to his own familiar domain, that of wood carving, while I was asking him about the female activity of making designs. In addition to the gendered dimension of creating figures and designs, which is indeed relevant, Héctor's shift is a poignant example of the crucial importance of the relation between designs and plastic images, which is foundational to the Kuna visual system. This relation is so deeply embedded in Kuna ontology that I dare say that no shift of topic had been made at all from Héctor's perspective. All he did was to point at a solution for my problems. Héctor did not change the topic of discourse but its object. This is therefore not yet another study of mola designs, nor one on the aesthetic value of sculptural forms among the Kuna. It is rather a study of designs and images in Kuna ontology. The difference is radical, in that I do not aim here to give an outline of Kuna visual art, positing its de facto existence. On the contrary, I actively avoid circumscribing art within a specific domain of Kuna life, although I am forced by language exigencies and issues of comprehensibility to use such terms as visual art and sometimes even aesthetics. What I aim to do is to make sense of the Kuna concepts 'design,' narmakkalet, and 'image,' the latter intended both in its tangible, concrete form, sopalet, and in its immaterial form, as 'soul,' purpa. Furthermore, the particular relation between the concrete image, nuchukana, and the immaterial image, purpakana, is the key to understanding wood carving without appealing to Western theories of representation. The riddle that Héctor posed to me is not a simple one. However, I can appeal to earlier anthropologists who noted the same problem when they tried to describe the art of American Indians. That these scholars, some many years ago, noted something that still preoccupies people like Héctor today is proof of their research acumen and points to a wider and yet little explored problem concerning Amerindian ontologies. When making simple totemic figures, the artist is free to shape its subjects without adapting them to the forms of utensils, but owing to their large size, he is limited by the cylindrical form of the trunk of the tree from which they are carved. The native artist is almost always restrained by the shape of the object to which the decoration is applied. When the artist desires realistic truth he is quite able to attain it. This is not often the case; generally the object of artistic work is decorative and the representation follows the principles developed in decorative art. For Boas decorative and figurative art were defined following the Western canon and therefore considered two hierarchically separate techniques. Figuration was the highest form of art. Nonetheless, he was able to observe ethnographically the irreducibility of Northwest Coast art to either figurative or decorative art, a problem that was later addressed by Claude Lévi-Strauss. Within the range of the merely decorative, and sometimes of the symbolic as well, the arts of South America frequently evince originality and fantasy. They are feeble in adding interest and skill in representation, which would have led to products like those of the Maya—or Egyptian and Chinese—in which lifelikeness, an approach to the realities of nature, is attained along with the successful retention of both decorative and religious expression. Besides the evidence of the absence of anything like the Northwest Coast totem poles in South America, what is remarkable is the coincidence of both Boas's and Kroeber's statements in respect of the prominence of decorative over figurative art. I wish to extend Boas's remark that "when the artist desires realistic truth he is quite able to attain it" to South American art, insofar as I reject the idea that Kuna people, and other Amerindians, are not able to attain figuration. What is interesting, in my view, is focusing on what Kuna people actually do instead of what they apparently do not do. Therefore, what Kroeber described as "feebleness in representation" could well be the clue to the distinctiveness of Amerindian art. Lévi-Strauss demonstrated that the Amerindian aversion to figuration is in fact a nonproblem. In his seminal study of face painting among the Brazilian Caduveo he showed that the opposition between the plastic form of the face and the designs painted on it, which are defined as "geometric" in the Western aesthetic tradition, is a powerful analytical perspective through which to look at Amerindian art. Lévi-Strauss cogently argued that face and design are inseparable aspects of the person, and each one cannot be conceived as separated from the other: "In native thought … the design is the face, or rather it creates it". In the same essay, "Split Representation in the Art of Asia and America", he showed that the opposition between graphic and plastic is a much wider problem, and it is key to understanding Amerindian art. Following the lead of Lévi-Strauss, Gow showed that the opposition between designs and images is widespread among Amazonians, although it still needs to be addressed ethnographically. The recent work of Lagrou on the Cashinahua is one of the most complete analyses focusing on an Amerindian design system. The richness of her ethnography is key to her exploration of the Cashinahua visual system, where designs are the main medium for communicating with nonhuman agencies and fabricating beautiful human bodies. Lagrou also demonstrates how the categories 'design,' kene, 'figure,' dami, and 'image,' yuxin, are central to Cashinahua experience of the world. As a Cashinahua woman cogently explained to Lagrou, "Designs are the language of yuxin". Although Amerindian concepts of designs have been richly explored, indigenous conceptualizations of plastic forms remain little studied. Barcelos Neto's fine work, on "plastic cosmology" and the rituals of masks among the Wauja from the Upper Xingu (central Brazil), is a rare exception. Another exception is Eduardo Viveiros de Castro's work on the Yawalapíti. Much of his ethnographic analysis of the experiential categories of the Yawalapíti is devoted to the relationship between what he defines as the archetypical model of each living being and its actual form in the everyday life. The Yawalapíti experience this relationship as a series of differences hierarchically organized along a continuum, which ranges from the archetypal mythic beings, living a separate life and unreachable by human beings, to their earthy, and inescapably imperfect, actualization. Each species, including human beings, has a prototype that was created in mythic time and that stands for the species in general. Individual living beings are the actualization of such prototypes. This is also illustrated in myths, which describe how Kwamuty, the creator, fabricated the first human beings using the wood of a tree. In so doing, Kwamuty made, as it were, the first replica from the original, creating an "actual" being, inutayã, from the "original" model, umañi. "As a matter of fact, Kwamuty made the prototype of 'making': he transformed tree trunks into the first human beings". Viveiros de Castro suggests that the slippage between symbol and referent is a pervasive feature of Yawalapíti thought and is subsumed to the relation between archetype and actualization. Any actualization, he argues, is always a weaker replica of the original for the Yawalapíti. Similarly, for the Cashinahua, a drawn 'figure,' dami, looks less like its model than a real 'image,' yuxin, which is intended as the immaterial double that each living being possesses. It seems to me that the Yawalapíti idea of the original act of creation as an act of replication—defined by an incommensurability between original and replica—is a suggestive description of what is a sculpture for Amerindians, which helps us to understand Kuna ideas about the nature of images and figuration. I argue that the non-iconic nature of images lies at the core of the Kuna visual system, as well as that of other Amerindians. Although this may seem a bold statement, I endeavor to demonstrate its validity in the course of this work. I will refer to the case of mortuary rituals and the use of wooden logs to represent deceased people in the Upper Xingu region of central Brazil, where the Yawalapíti and other indigenous people live. Through this comparison I will argue that the carving of nuchukana is linked to the idea of the irreversibility of death. In carving images of a person, Kuna people rehearse the incommensurability between the living and forms of alterity. It is by acknowledging this ontological distance, at the core of Kuna sociocosmological theory, that we can make sense of their visual art. By mastering the process of giving shape and transformation, Kuna carvers and ritual specialists become able to establish power relations with immortal beings, seeking their help to cure illnesses and prevent death. The difference between an image and what it is an image of is at the core of Kuna ontology, similar to saying that for the Yawalapíti a symbol is always different from its referent. This, I suspect, is not caused by an ambivalence intrinsic to the cognitive process of representation, as Goody would have it, but it has its roots in the reflection of Kuna people on life and on the irreversibility of death. My point is that carving images of a person for Kuna people is an act that instantiates a reflection on the human condition, which is defined by birth and death and by the interaction with forms of nonhuman alterity. By the same token, carving a nuchu is a declaration of alterity from death and the establishment of identity for the living. By replicating the original act of creation, through which immortal tree beings were created, wood carving establishes the difference between mortal and immortal beings. This artful process is aimed among Kuna people at curing illnesses, which is the opposite of dying. Curing is in fact a process through which the person has to be recomposed in its unity. It is the unity of the human person, achieved through the fabrication and maintenance of proper human bodies, that requires a skilful balance between soul and body, between internal forms and external appearances, in other words, between image and design. This book argues that the relation between designs and images lies at the core of the Kuna theory of personhood. Kuna people consider persons as formed by elements that have their own independent life in the universe, which are then transformed and molded into human bodies by adult people. The Kuna theory of visual art is therefore identical to their ontology; it provides people with categories to know the world. Concepts such as image and design are embedded in social praxis and not just abstract ones. Images and designs are not categories of the aesthetic; they are category of praxis. For this reason I frame my analysis around the Kuna concepts of image and design as minimal categories of Kuna visual art.6 Although in this book I focus on Kuna wooden figures, with some attention to canoe making and design, there are other forms of visual art in the Kuna lived world. Basket weaving, carving of stools and other objects, clay molding, and beadwork are important activities in the everyday life of Kuna. The Kuna people I met directed me to those forms that seem to concern the most and thus provide the best objects for an analysis of their visual system. Furthermore, Kuna verbal art has been studied extensively by Sherzer, who has produced illuminating analyses of the integration of verbal forms and social life. In this work I deal exclusively with those categories of human experience that inform Kuna ideas about visual capacity. For this reason I do not endeavor to integrate visual and verbal art into a wider field of aesthetics, which would require further ethnographic research. Similar to Munn's discussion of the Walbiri, Kuna women's designs, molakana, are the objectification of the subjective experience of Kuna women. Nuchukana are instead the outcome of the male equivalent of female fertility. In each of these two activities—sewing designs and carving figures—one category is concretized at the expense of the other: carving the figure of a person means to produce the generic representation of a gendered person; sewing designs manifests the individual praxis of each woman. Male and female nuchukana are carved to represent their general gendered attributes but without any of the specific features that would render them similar to an individual living being. Carving a nuchu points to the basic principle that each living being shares the same original, or true, form, which is that of a person. By the same token, a nuchu is the instantiation of an impossible form, at least from the perspective of human beings. It instantiates the immortal dead that are ever different from the living, for they lack the basic attribute of the latter: the human body. Nuchukana are self-different figures; they are different from themselves, insofar as they lack external features by means of which to abduct their internal forms. Like Yanomamy xapiripë spirits, they are not iconic images, although, unlike them, they are visible in normal waking experience. The realization of designs by Kuna women is part of the wider process of making oneself visible within the network of social relations. Making mola designs and carving nuchukana are aspects of the life trajectory of a Kuna person who develops his or her own praxis during the course of a lifetime. In this work, I do not focus on mola as such but instead on designs, of which molakana are an instantiation. To this end I explore the category 'design,' narmakkalet, and the concept 'beautiful,' yer tayleke, which tend to coincide for Kuna people, insofar as what is beautiful is compellingly decorated with designs and attracts the gaze of humans and nonhumans alike. On the other hand, what is 'ugly,' kachar tayleke, has the effect of repelling the onlooker. Seeing means to get close and grasp one's inner self, as composed by a self and an Other, the human and the nonhuman, animal, component of the person. It is by appreciating the mixed composition of newborns that adult kinspeople are able to create new human people through the transformation and neutralization of the nonhuman side. Becoming visible is thus coextensive with becoming human, that is, being visually available to establish social relationships with other human beings. According to the Kuna, it is by reaching a balance between the internal and the external form that real human persons are created. The curiosity of Baron Erlan Nordenskiöld was attracted by Kuna wooden statues during his expedition in Panamá in 1927. His descriptions of nuchukana are accurate and reliable and give details on the rituals in which they are involved. He returned to Sweden with a few exemplars, which are now kept in the archives of the Museum of World Culture (Världskultur Museet) in Göteborg. Nordenskiöld considered the possibility that nuchukana were the representation of Christian saints, and with this idea in mind he compared Kuna wooden figures with the ones created by their neighbors, the Emberà, living between Panamá and Colombia. However, his analysis remains conjectural, and he did not develop it further, nor did he visit the Kuna again after his first trip. On nelekana, or seers, Nordenskiöld received reliable information from his Kuna informant, Ruben Pérez, who was secretary to the Kuna chief and seer Nele Kantule, political leader of all the Kuna during the first half of the twentieth century. Another invaluable source of comparison for the present work is the ethnography of Chapin, which provides a wealth of detailed information on Kuna cosmology, personhood, and rituals. Moreover, I use some versions of Kuna myths that Chapin collected and translated into Spanish during the late 1960s when he was living in Kuna Yala as a Peace Corps volunteer. Severi, in his extensive study of Kuna conceptions of suffering and memory and of the pictographic representation of curing chants, often describes nuchukana and nelekana. Moreover, Severi provides useful insights on the concepts of purpa (soul, image) and kurkin (brain, intelligence), which I focus on in the course of this work, through my own ethnography (see especially chaps. 4 and 5). Taussig focuses on nuchukana as the privileged object of his inquiry on the mimetic faculty. His study concentrates on the way Western imagery is perceived by Kuna people—and, he argues, by colonized people in general—by focusing on one aspect of nuchukana previously noted by Nordenskiöld and later by Chapin, namely, the representation of European types in Kuna wooden figures. Taussig argues that Kuna people aim to abduct the power of white people by representing their image in their wooden statues. He reaches the conclusion that the power of nuchukana resides in the fact that they are copies of white people. Although Taussig addresses the interesting problem of the representation of white people in Kuna sculptures, he fails to address the two main issues arising from it: What do white people represent for the Kuna? What is an image for them? As for the first question, this has been already addressed in part by Severi, who studied the healing song for madness, nia ikar, and argued that for the Kuna the evil spirit that causes people to become ill, Nia, is associated with the historical figure of white people and their disastrous encounter with Kuna people. Severi thus argues that madness, the most dangerous form of other-becoming, is conceived today by the Kuna as a transformation of the self. I wish to suggest that white people should be understood as one, perhaps the most distant, form of alterity for the Kuna, although this does not constitute directly the topic of the present work. This of course poses problems for Taussig's thesis on the mimetic faculty applied to Kuna ontology. Although his argument is an interesting digression on Benjamin's reassessment of mimesis, I suggest it does not shed much light on the Kuna theory of images. As might already be evident, the position that I adopt in this work is to follow Kuna categories as closely as possible, using only them to understand the world as they see it. In so doing, I come to a different conclusion from that reached by Taussig. It is not by looking at what they allegedly represent (although I maintain that the "white people problem" is an interesting one) that we might be able to understand Kuna wooden sculptures11 but by looking at what they are not, or what they are the transformation of. As I noted above, by being an instantiation of human mortality, Kuna wooden statues are a representation of absence. It is by being the negation of the very possibility of representation that nuchukana establish their own agency in the world. It is therefore by focusing on the fullness of human life that I will carry out my ethnographic analysis of Kuna wood carving. I consider birth and the coming into being in the world as key moments to understanding Kuna concepts of the visual. I also argue that the concept of humanity must be the focus of any study that chooses art as its object—a far cry indeed from mimesis. In addition, I find it more appealing and realistic to think that Kuna people themselves chose what they found appealing about foreign colonialists. I do not think that the Kuna consider white people appealing tout court, even less that they want to become white. I rather think that it is analytically significant to start from the idea that Amerindian cosmologies were already open to alterity when Europeans so abruptly appeared on the scene. It is exactly the transformability of Amerindian lived words that so easily tricks the observer into recognizing some familiar aspect. By the same token, I find, and I am not alone, that it is important to explore what indigenous people do and say, as their own personal and distinctive point of view on life, and to focus the attention "from start to finish" on indigenous voices. This has powerful implications, which, if we refrain from seeing fake reflected images of ourselves where they do not exist, might provide new insights into the variability of human nature. A few Kuna villages are located on the mainland; the majority are on small islands close to the coast, each with a population ranging from a few hundred to four thousand individuals. Other villages are situated in the interior of the region and in the Darién forest, and there are two villages in the Colombian territory on the Gulf of Urabá. About 35,000 Kuna live in the Comarca Kuna Yala, which comprises the San Blas islands and a narrow strip of coastal land stretching westward for more than two hundred kilometers from the Colombian border. Another 25,000 Kuna live between Panama City and Colón. The language of the Kuna, tule kaya, although still a matter of debate, is considered affiliated with the Chibcha family. When entering a Kuna house, one is struck by the strong contrast between the bright sunlight outside and the darkness inside. The eyes slowly become accustomed to the dim light of the interior and begin to discern the shapes of the objects and persons. Hammocks hang between the main horizontal poles; one bed is positioned in one sector of the house separated by a cane wall. A wooden trunk supported by four legs is along the cane wall; wooden stools and plastic chairs are scattered around. A small table, used by children for their homework, is in a corner. Plastic buckets used to preserve various kinds of objects from the dust and the saline air line the walls. Clothes hang from cane sticks attached to the roof with lines that can be pulled down when necessary. A Singer pedal sewing machine is positioned close to the door, where some light comes in. During the day the house is relatively calm and silent as the members of the extended family spend most of their time in the kitchen, a separate hut, and on the patio. At the foot of one of two main posts, one can distinguish, with some difficulty, a plastic box containing a tight group of small, carved wooden statues standing upright one beside the other. They are the nuchukana, the anthropomorphic figures carved by elderly Kuna men, used in healing rituals and kept in each house as protection against evil spirits. These small wooden statues measure between five and thirty centimeters and represent both males and females. On the occasion of the celebration of village-wide healing rituals special statues more than a meter tall, called ukkurwalakana, are carved in balsawood. These lose their vitality at the completion of the ritual and are either discarded or, more rarely, kept on house patios as decorative items. The features of the face are sketchy. A prominent straight nose is the hallmark of every nuchu, and it is attained by carving out the rest of the face, which results in a flat surface where sometimes little holes are incised to host the glass beads that represent the eyes; the mouth is almost never represented. Male figures are normally carved wearing a flat-topped hat, a shirt, sometimes with a tie, and trousers. Female figures are made wearing a headscarf going down to the shoulders, a shirt, and a long skirt. The shape of the breasts is often visible. Sometimes the clothes are painted with artificial colors and the cheeks colored with makep (Bixa orellana). A few of the figures also wear bead necklaces across the neck and torso, similar to those worn by Kuna curing specialists symbolizing their healing capacities. All the nuchukana in each house are kept together in the same box, called ulu, meaning "canoe." Together they form a quite homogeneous ensemble, regardless of differences in size and style of carving, with some being older and more deteriorated than others. Despite or perhaps because of their importance in Kuna daily life, nuchukana are kept relatively out of sight, and it took me a few months to notice their presence in almost every household. One of the first definitions of nuchukana that I received was that they are nelekana, or seers. They are powerful, knowledgeable beings, able to cure illnesses by confronting the pathogenic entities of animal beings, ponikana, and demons, niakana. Despite their nonhuman nature, they might be valiant helpers of Kuna people. To this aim ritual specialists have to befriend them, and members of the family have to establish commensal relationships with them. Literally each nuchu, after having been carved by an elder specialist, has to be incorporated in the household by the people who will look after it and seek its protection. Normally it is the 'grandfather,' tata, who sings chants during the night to speak with his nuchukana and greet them, or who calls them in the afternoon when he sits at the table, inviting them to join the meal. The 'grandmother,' muu, puffs tobacco smoke from a pipe or a cigarette on nuchukana to refresh and strengthen them. All these quotidian acts show nuchukana that the people living in the household "remember" them and think of them. We can therefore say that human beings and nuchukana are effectively coresidents. Despite the ontological alterity of nuchukana, their power and agency might be harnessed for the sake of humans' protection against forms of predator alterity, such as that of ponikana. Crucial in the process of mediation between people and nuchukana is the figure of the nele proper, the human seer, who by virtue of his capacity to see is able to establish direct relationships with nuchukana. In this work I therefore focus on the relationship between nuchu and nele, which I argue is vital in shedding light on Kuna sociocosmological preoccupations and understanding the interplay between the visible and the invisible in Kuna ontology. Nelekana are born shamans who are able to see animal and tree entities in dreams. In developing their capacity to see through initiation ceremonies, nelekana become able to see illnesses within the human body. Among the Kuna ritual specialists, they are the diagnosticians of illness. The curing of illnesses, on the other hand, is then performed either by a 'medicine man,' ina tuleti, who is expert in the preparation of plant medicines, or by a 'ritual chanter,' api sua, who knows the healing 'chants,' ikarkana. The major skill of nelekana is therefore that of seeing beyond the limits of the visible, to which normal people, including the other categories of specialists, are bound. They learn to see and to control their dreams in order to interact with supernatural entities and to learn their ancestral knowledge. This knowledge may then be transmitted to other curing specialists or directly used by nelekana to cure ill persons. A nele may be consulted when a person becomes ill, to discover the cause of the illness, or when epidemics spread in a village. In the latter case, once the nele has discovered the cause that afflicts the entire village, he helps the api sua in the performance of an eight-day-long collective healing ritual, called nek apsoket, to rid the village of the presence of malevolent entities. Kuna people are clear in saying that nelekana are different from other ritual specialists because they are born with a particular gift that renders them able to see nonhuman entities in dreams as people. This distinction by birth is manifested by the fact that nelekana, different from other babies, have no designs on the remains of their amniotic sac at birth. The absence of what I call amniotic design, is the index of the nele's shamanic capacity. This, as becomes clear in the second part of the book, is a striking example of how Kuna people think of the formation of the human person through a rather elaborate theory of the body that emphasizes its visual appearance. Amniotic designs are innate in the sense that they are "the visual instantiation of designs as entities in the world". Their invisibility is an equally revelatory sign, as it points to the powerful, not fully human nature of the nele, which indeed gives him visual access to cosmic transformations. I would like to point out at this point that throughout my work I refer to the nele as a male person, a he. This does not mean that there are no female nelekana; in fact, there are many. Kuna people always emphasize that only male nelekana are born nele. Women may become nele once they are adults, and this happens as a result of being pregnant with a nele son (see chap. 5) I have chosen throughout my work when I speak in general about seers to focus on the "ideal figure" of nele from birth as a male, as Kuna people described it to me. In several chapters I discuss individual cases of female nele. Until now, an ethnography that focuses on wood carving and shamanism among the Kuna has not been undertaken. This work is an ethnographic account of the Kuna people's lived world as I came to know it, living in the village of Okopsukkun between March 2003 and November 2004. Like the majority of Kuna villages in the Kuna Yala district of Panamá, Okopsukkun is situated on an island a short distance from the coast. The island is occupied by two independent villages, Ustupu and Okopsukkun. Although the border between them is not noticeable to foreign eyes, the division is clear in terms of administration and population. On my first visit to Okopsukkun I landed in a small aircraft at the small airport on the mainland coast. I then crossed the channel to the island by canoe with an outboard motor. I did not know at that moment how many times I would make this same trip, paddling in a dugout canoe, with a Kuna friend, back and forth from the island to the mainland forest. Arriving from the sea, the sight of the densely inhabited island, one house attached to the other, was completely different from what I had seen from the airplane. Before reaching the island, I was struck by the incredible silence—except for the humming of the motor. Once I got to the island the picture changed completely. A crowd of people, mostly children, was waiting for Margherita—my partner and fellow anthropologist—and me in front of the house where we would live for the first period of our fieldwork. Margherita had already been living in Okopsukkun doing fieldwork for two months before my arrival, and thus everyone was already aware that her 'partner,' we sui, was about to arrive as well. Our luggage was instantly taken inside the house, and I soon found myself seated with a glass of matun, a sweet plantain drink, in one hand and bread in the other, attentively observed by a crowd of children. In the months after my arrival in Okopsukkun I slowly learned how to adjust to the new style of life. I got rid of my shoes and many unnecessary clothes, and I soon bought a pair of rubber sandals sold by the Colombian traders who constantly travel along the Kuna islands. I learned how to eat tule masi, 'people's food,' by putting a pinch of salt and some chile on a corner of the plate, then with a spoon mixing alternating bites of plantain and fish. I learned to take three or four showers a day, with the fresh river water that, thanks to the aqueduct, arrives, although quite irregularly, in each house. I learned to be ready by half past six in the evening, dressed in long trousers and a shirt, to go to the 'gathering house,' Onmakket neka, where the chiefs sing long mythic chants, describing the creation of the world.13 After two months I learned to wake up at five o'clock in the morning to cross the sea channel by canoe and get to the mainland forest. My first trip to the forest was with Beatriz Alba, a Kuna grandmother in her sixties who volunteered to accompany me ton the forest to collect mangoes after she noticed that I was snubbed by most of the men. After that first experience I realized that I needed a pair of rubber boots, which all Kuna men have. But I had to wait for my next trip to Panama City to buy them, for it was impossible to find boots my size on the island or from Colombian traders. I felt very proud when I went back with my new boots and my new machete. However, it would be some time before I realized how hard the daily work of Kuna men is. Kuna women spend most of their time in their houses, preparing food and drink, sewing molakana, attending the morning meetings in the gathering house, and visiting their kinspeople. Men travel almost every day to the forest, leaving at dawn and usually returning at midday. When they do certain kinds of gardening work, such as felling trees or sowing and collecting maize, they may stay away until late in the evening, sometimes until the next day. Accompanying Kuna men to the mainland forest to collect food, such as plantain or manioc, I soon realized that every man works alone most of the time. Except for felling trees and gathering maize, which are often done by groups of men, and except for working in the few big gardens that are cultivated collectively by the adult men of the village, gardening is an individual activity and requires skill and knowledge of the forest, its plants, trees, and animals. Most of all, it requires the energy of young men who alone carry great quantities of crops for long distances and then paddle back to the island, where their wives wait for them ready to bring the crops into the house and start preparing food. Besides being gardeners, most Kuna men are fishermen, procuring their families' daily meal. They mostly fish in the sea near the island, usually with a simple line and a hook. Few people in Okopsukkun possessed fishing nets or an outboard motor during the period of my fieldwork, which would allow them to catch great quantities of fish in the nearby Sukkunya gulf and sell it to other people. Fish and garden crops provide the daily food for each family, which is supplemented by and sometimes substituted with the products bought in the small local shops (Sp., tiendas) or by Colombian traders, such as sugar, cocoa powder, rice, pasta, and canned fish. Although I had many occasions to travel to the mainland forest, I unfortunately never learned how to be a gardener and to procure the food to take home. Our Kuna friends used to laugh at me, saying that I was not a good companion for Margherita as I was not taking good care of her by working in the forest. But then they also added that as we had no children yet I still had time to learn. On one occasion I went to the forest with Garibaldo del Vasto, a Kuna medicine man in his fifties. Garibaldo decided to take me on a practice lesson to show me how he worked in the forest collecting medicines. That was probably the most amazing experience I ever had while living among the Kuna and remains vivid in my memory. We set out early in the morning with one of his sister's sons, who was his apprentice. After paddling for two hours we reached the coast at a place east of the island, close to the gulf of Sukkunya. We left the canoe among the mangroves and continued on foot. We walked in the forest for more than eight hours, during which Garibaldo never stopped talking to me. He explained almost everything he was doing, from the ways in which he cut the bark from trees to collecting medicines; he told me the names of the trees, vines, and shrubs as we walked along. He showed me his gardens, told me whose garden he helped to clear of trees in the past, and showed me the gardens of other people we passed by, commenting on the way they were looked after. He stopped to listen to the cries of animals, telling me which animals they were. He showed me how he put together different types of plant medicines in his baskets, depending on the medicine he wanted to prepare, in order to be able to recognize them once back home. He told me the names of the rivers and explained to me, while we were bathing, that the river water is filled with the properties of the plants that grow on its banks. Then, on the way back to the canoe, he stopped at a huge tree, an ikwawala (Dipteryx panamensis). He took his machete out and started cutting off one of the exposed roots at the base. He cut out a piece of root about thirty centimeters long, sat on a stone, and started removing the bark. Once the inner white wood was exposed, he made a cut on one side of the log, close to one extremity. He looked at me and with his usual pedagogic grin said, "You think that what I'm doing is for fun, don't you?" Then he put the log in his bag, along with the other roots and vines collected during the day, and we set out on our way back to the island.